The Waldorf Pulse 2 Analog Synthesizer offers cutting edge powerful lows in a compact box. The Pulse is back with a vengeance now with even more brute-strength power onboard. With the Pulse 2 youre looking at a completely analog synthesizer that accurately delivers what synthesizer enthusiasts around the world truly crave. 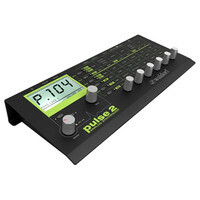 Pulse 2 is the reincarnation of its legendary ancestor the Waldorf Pulse that dominated the electronic music of the 90s. This entry was posted in Waldorf and tagged Keyboards-and-Pianos. Bookmark the permalink.